James Taylor’s Fire and Rain remembered at a beach park funeral on Maui. Decision making in music has always fascinated me. How does a performer decide which works to include in a concert? How does a composer decide which notes to use? How does an arranger decide which works to arrange? Sometimes the occasion commands it. A few days ago I received an e-mail from a colleague asking if I could suggest someone to play James Taylor’s “Fire and Rain” for a funeral at a beach park on Maui. The song evoked memories of going to college in North Carolina and a nostalgia of lost youth. I never really understood the lyrics until another colleague, who attended the funeral today, recited the words verbatim and eluded to a story behind it. 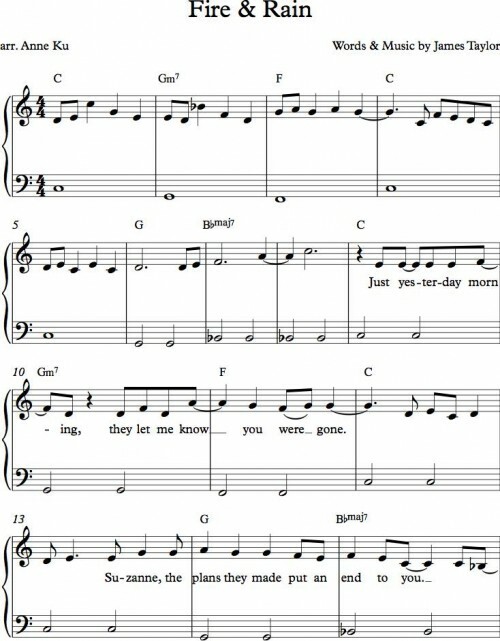 The sticky melody lured me to find sheet music on the Internet. A Czech piano teacher arranged it for piano solo, and I was grateful someone sponsored it for free downloads from his website, which categorized his arrangements by level of difficulty. This led me to discover new arrangements, new works, and new possibilities. When I looked around for James Taylor’s original version, I found that it was written in the key of C major after all. What’s interesting is that the guitar chords are in A major. Capo it on the third fret and you get it in C major, which is the easiest key to play on piano. When arranging this for my adult beginner students, I had to think about hand positions and fingerings. Which parts of the accompaniment should I retain and still preserve the essence of James Taylor? For beginning piano students, it’s hard to coordinate the right and left hands. It’s either one hand at a time or keep one hand steady and simple. The left hand just needs to do a simple bass line. The right hand can do the melody and parts of the unique accompaniment. This afternoon, at Kanaha Beach Park, a young man sang “Fire and Rain” while another played on a steel string guitar. By then I had heard different versions on Youtube and experimented with different versions on the piano. Surrounded by hundreds of mourners, we all listened and remembered the man who loved this song. Interesting post. I didn’t know the story behind the song either.